GCC spec Toyota with Rear wheel drive, 16″ wheels and ABS. Price reduced! Automatic 2018 Toyota Hilux with 17 inch wheels, power windows, CD player, black interior, white exterior. Imported spec. Imported spec 2018 Toyota featuring differential lock, downhill assist control , 4WD. White with black interior. Automatic 2016 Toyota Hilux with 17 inch wheels, AUX audio in, CD player, black interior, white exterior. Imported spec vehicle with 4 cylinder engine, grey interior and manual transmission. Toyota Hilux grey/silver pick up truck, black on the inside with CD player and ABS. 18″ wheels. Automatic Toyota Hilux with 17 inch wheels, power windows, tuner/radio, grey interior, grey/silver exterior. 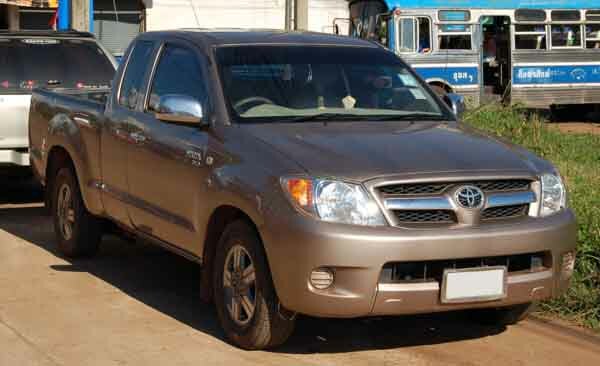 Imported spec Toyota Hilux with Air conditioning, 21″ wheels and CD player. Price reduced! 2016 Toyota with rear camera, cruise control, power locks. Grey/Silver with grey interior. White pick up truck, grey on the inside with AUX audio in and climate control. 15″ wheels. Manual, 17 inch wheels, 4WD, power locks, grey interior, white exterior. Price: AED 55,012. Manual, 17 inch wheels, CD player, power windows, grey interior, white exterior. AED 51,345 for this Manual Toyota Hilux with 17 inch wheels, airbags (front and side), fog lights, black interior, brown exterior. Imported spec Hilux from 2011 with a 4 cylinder engine. Blue pick up truck with grey interior. It has power locks and AUX audio in. 2012 Toyota Hilux with CD player, AUX audio in, air conditioning. It has grey interior and is White. Manual Toyota Hilux with 18 inch wheels, ABS, power windows, orange interior, grey/silver exterior. 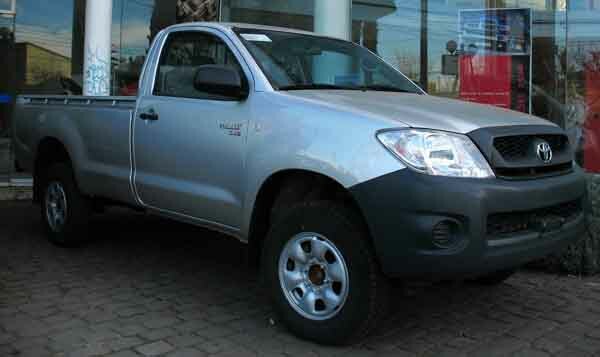 Bilal - On site, we have many 4x2 and 4x4 Toyota Hilux 2.7 VVTi models that just don’t give up. We’ve had them for over three years, and they just keep running. It doesn't matter if it's manual or automatic, they are built to last. Pros: Reliability and fuel economy. Colin - Bought myself a 2016 pre owned Toyota Hilux SR5 at an excellent price. It’s the perfect car for the worksite and in top trim, it’s got all the specs one could need. Cons: Impression it gives off. 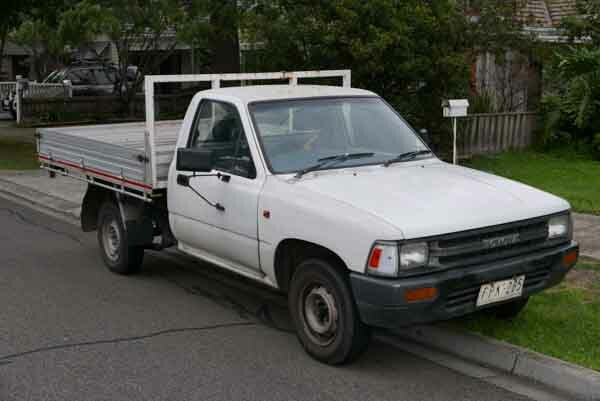 Taher - I bought a second hand Toyota Hilux GLX a few years ago and to this day, it’s still going strong. No major problems to report from the 2.4L diesel version I own as well. Excellent cars and good price. Pros: Touch, fuel economy and price. You can literally drop them from a great height and with the tools you find in an ordinary toolkit, you can repair these cars. Due to their robustness, they maintain a good resale value and are relatively cheap to buy. In 2016 trim, the sturdy Hilux received a massive overhaul, allowing up-to-date options being made available. They don’t just sell well in the UAE, in both import and export markets they sell like water. Not only does it come with a four-cylinder motor, but V6 engines are also available for an extra kick in older generations. 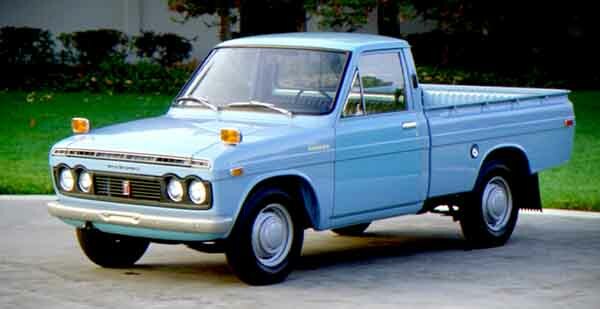 Debuting in the late 60’s, Toyota entered the pickup market with their very own truck. Ever since then, it’s popularity has grown all over the world apart from a handful of countries where it was once sold or in some cases never sold at all. These cars have a long standing history of being ultra reliable and can pretty much deal with anything and everything thrown at them such as fires, savage beatings and even sitting atop a building about to be demolished. Road Rivals on the streets of Dubai: Mitsubishi L200, Ford Ranger and Nissan Navara. In its first generation, the pickup ran on a short chassis with a 1.5-litre four cylinder motor powering the rear wheels via a manual transmission. With its small appearance, the truck was capable of reaching speeds of 130 km/h. Sporting a body which is very time relevant, it was marketed as a luxury pickup with fabric seats and manual accessories with coil springs mounted underneath. Just one year after production, a long wheelbase was introduced into the domestic market and in 1971 a larger four-cylinder petrol engine was introduced for additional power. Looking to buy a used Toyota Hilux for sale in Dubai, UAE. These models are particularly rare in the GCC. Rolling into its second generation, Toyota reworked the exterior for a more refined look, and they jazzed up the interior for a more inviting ride. Options remained the same both inside and out. New beds joined the lineup, including a flatbed and extended bed for certain markets. The four cylinder motor returned now with an optional higher displacement of 2.2-litres, and the manual transmission returned to power the rear wheels also with an extra 5-speed option. Want to buy a pre owned Toyota Hilux for sale in Dubai, UAE? These models are also quite rare. Entering its third generation, the pickup once again grew to form a much larger vehicle and was once again built in a variety of shapes including a camper style and the four-door model entered production. The third generation also sparked the beginning of the 4WD setup with the brand now giving customers a choice of either rear wheel drive or four wheel drive which came as a welcome option for fans and loyal customers. Once again, features from the past few years returned and the third generation, the SR5 was introduced along with Mojave trims. The latter features bucket seats; multi-speaker setup hooked up to a radio and chrome front bumpers. Air conditioning, cruise control and power steering were available as optional extras. Four-cylinder engines were retained once again with a few displacements dropping from the list and being replaced by new ones. Manual transmissions returned and making it’s grand debut was the three-speed automatic gearbox. 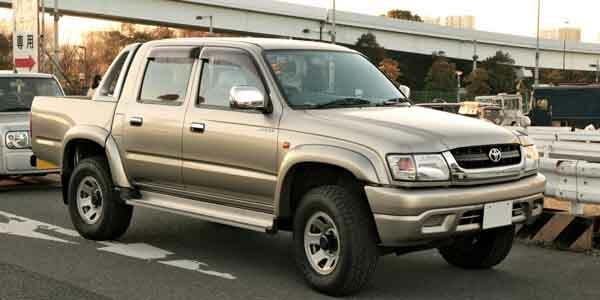 Want to buy a second hand Toyota Hilux for sale in Dubai, UAE. Much like the previous generations, these models are scarce in the UAE. The fourth generation, introduced the Xtracab extended which added an extra storage area behind the seats in two door version. Once again, the exterior was ironed out for a refined look. Square headlights took over from round one's up front and mounted on both sides are indicators and secondary lights. Interior options are identical identical to the previous years. Towards the end of this generation, a V6 motor was made available to power either the rear wheels or all four of them mated to either a manual or automatic gearbox. Looking to buy a used Toyota Hilux for sale in Dubai, UAE in this generation? Better start looking overseas as once again these models are quite rare. 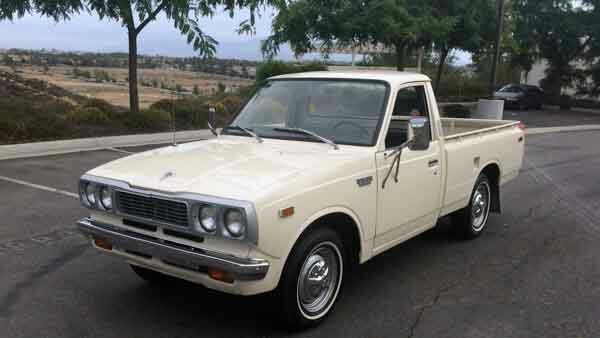 Now in its fifth generation, once again Toyota reworked the front end giving the vehicle a brighter grille with faux metal trim to stand out along with slightly altered headlights with side lights also receiving a minor upgrade. Overall the body work similarly with a few creases ironed out giving the vehicle more of a straight look. Xtracab models which were introduced in the previous generation grew regarding extra space available behind the seats. However, no normal human being can fit there. 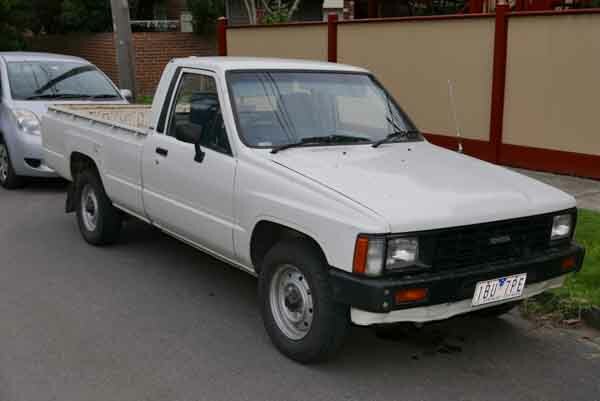 Available with multiple bed options, in 1991, the pickup received a minor grille enhancements and the new Toyota emblem. Once again the V6 and inline four-cylinders returned for a few more years mated to a manual or automatic gearbox. Also returning are the pickup body styles. Towards the end of this generation, the Hilux would be phased out of the US market as replaced with the Tacoma instead. 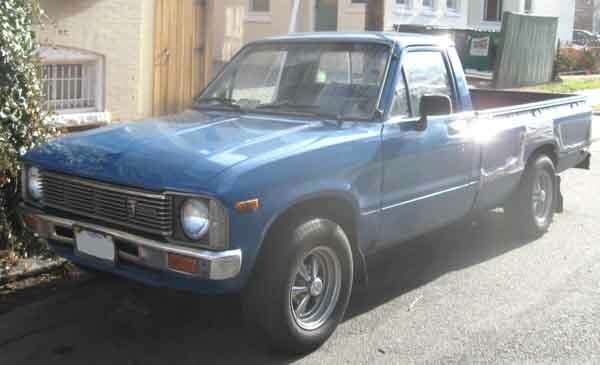 Want to buy a second hand Toyota Hilux from this generation? Prices start at AED 17,000. Returning for a sixth generation, the sturdy pickup truck went under the knife once again and now features a smaller front grille and redesigned headlights. Side panels now feature a prominent line running from the front wheel all the way to the rear. Minor interior touches are present. All the engines returned for another few years mated to either a manual or automatic gearbox powering the rear or all four wheels. During this time, the Hilux was phased out of the Japanese market with no replacement. Looking to buy a used Toyota Hilux for sale in Dubai, UAE. This generation starts at AED 15,000 for the American Toyota 4-Runner. Toyota’s Hilux entered its seventh generation and received a massive overhaul to both the interior and exterior. With a beefed up exterior, the pickup became more rounded as the years went by. With a larger, more dominant front grille, sharper headlights and increased curves above the wheels. Inside, the options list grew to include cruise control, air conditioning, media inputs, CD player, reverse camera and leather seats. Power seats were introduced at a later date. Although Revo and Vigo were added to set vehicles, this did not alter the car's trim in any way and is merely a name added in other countries. Around the world, the vehicle continued to pop up in various armies. In Singapore, it was even used as a Taxi Cab. Once again, Toyota entered the Dakar rally with two Hilux pickups. Even though they never won, their performances were spectacular finishing second twice. The inline four-cylinder motor and V6 continued to be produced with the V6 engine not being sold in the GCC. Engines continued to be mounted to a manual or automatic gearbox with various displacements available. 2008 saw the pick receive a mid-life refresh with an altered front end. 2011 saw the pickup receive another facelift once again making the vehicle more relevant. Aside from the retouch all around, the cabin was slightly revised and included more luxurious features in certain parts. Looking for a used Toyota Hilux for sale in Dubai, UAE? These models start from AED 42,000. Currently, in its eighth generation, the legendary pickup received an entirely new exterior with curves, new front grille with additionally new headlight housings. The rear end also received a revamp, giving the GCC the closest we’ll get to a Gulf spec Tacoma. Xenon headlights are available as are LED lights both as optional extras. Inside, the cabin is once again upgraded and in top trim now includes a medium sized screen with media options and in some cases navigation. Media inputs, Bluetooth, reverse camera and keyless go are also on the options list. A wide selection of engines are on offer including four cylinder motors with VVTi and in some areas the V6 (still not available in the GCC). All engines can be had with diesel or petrol injection while mated to a manual or automatic gearbox to power the rear or all four wheels. Both dual cab and single cab models are available in this generation with the Xtracab and flatbed models being filtered out towards the end of the sixth generation. 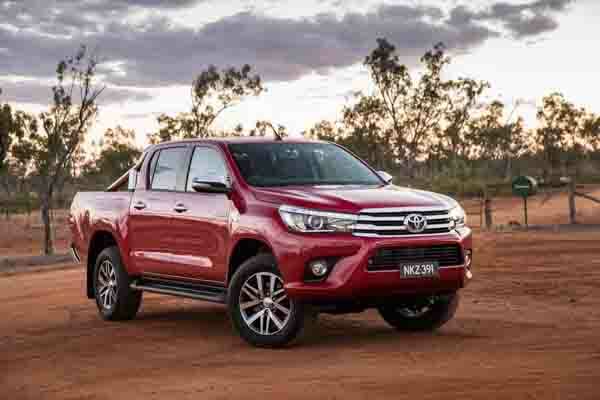 Looking for a 2016 Toyota Hilux for sale in the UAE? Prices start at AED 65,000.